TV with Thinus: SHOCKING WILD ENDING: The Wild on M-Net gives viewers a Mad Max(ine) cliffhanger ending as Maxine gets shot, Itumeleng gets stabbed. SHOCKING WILD ENDING: The Wild on M-Net gives viewers a Mad Max(ine) cliffhanger ending as Maxine gets shot, Itumeleng gets stabbed. 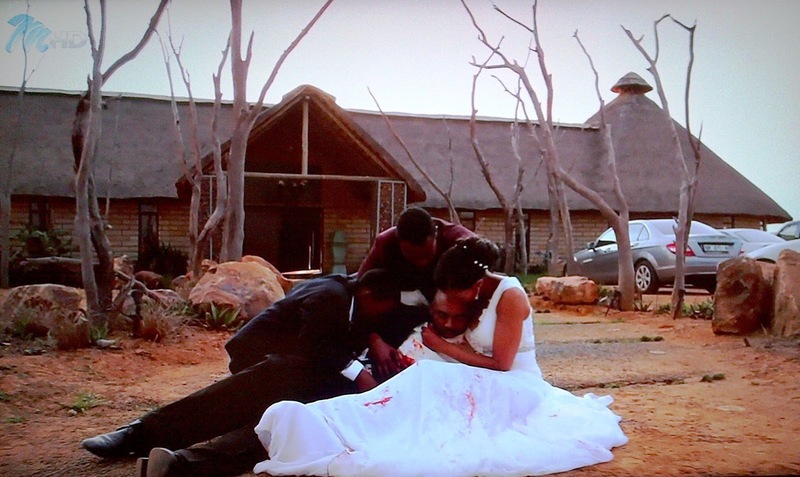 The Wild on M-Net, ending with a dramatic and over-the top-finale on Thursday night on the pay-TV broadcaster, gave viewers a cliffhanger send-off in the last episode with a deranged bride in a wedding dress wielding a gun who then got shot and killed herself, but not before she stabbed her lover which also led to his own death moments later as the camera panned back. The Wild finale on M-Net was a King Lear/Macbeth-esque, "Who killed JR?, Dynasty finale "Alexis Carrington falling over the railing fighting" shocker all rolled into one for the cancelled soap. The Wild went for big bloodletting - the soap was leaving television but it was taking people and casualties of its cancellation with it. 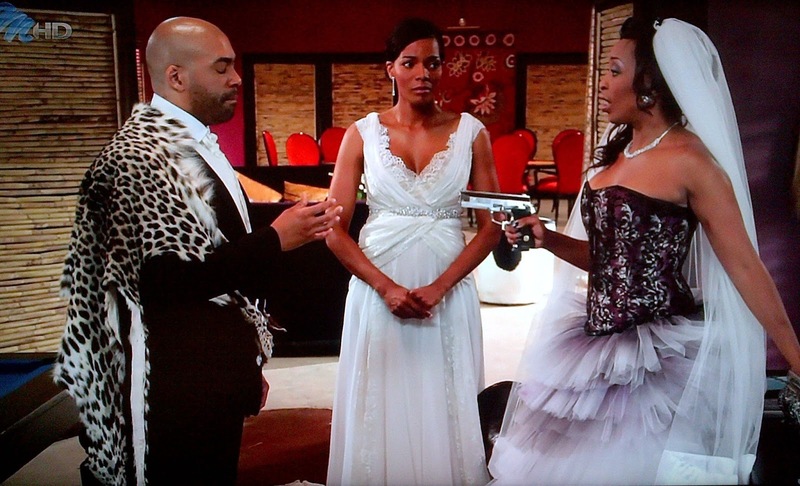 The raving mad Maxine with a gun first forced Itumeleng to recite wedding vows, after which they struggled. A shot rang out, and Itumeleng and mad Maxine both fell to the floor, her wedding dress splattered with blood. In her dying breaths she looked as if she was grabbing Itumeleng's testicles when he got a weird look on his face with her behind his back, but the Lady Macbeth with her hidden knife was in fact stabbing him - causing his death as well a few minutes later. "The King is dead," screamed Modise giving Tumisho Masha the soap's final line of dialogue ever, as the Dinaledi lodge characters came running and rain sifted downwards in a depressing tableau as closing scene. 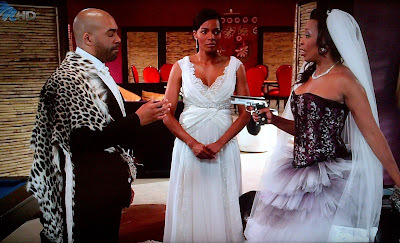 The best moment of The Wild's shocking finale was when Marang (Connie Ferguson) tried to make an emotional plea to the deranged Maxine (Khabonina Qubeka) who was pointing a silver gun at her. "Can you do it? Maxi, can you kill me and my unborn child?" asked Marang, desperately seeking sympathy. The psycopathic Maxine then lowered the gun from Marang's face to her belly in a hilarious (but hilarious great moment because it's oh-so overdramatic). The delusional psychopath demanding her lover marry her, the shoot-out in wedding dresses (and the viewer teased about who got the bullet), the subsequent stabbing scene (also played for suspense), the dramatic dying scenes (oh how King Lear! oh how Macbeth! ), blood-spattered wedding dresses and the terrible crying was classic soap telenovela stuff. In its shocking finale The Wild on M-Net becomes not just a soap but similar to Shakespeare's Macbeth actually a dark tragedy. The soap which struck a downbeat, dramatically somber and depressing tone in the end didn't have a happy ending. It ended with crying, sadness, tears, a sense of loss and a deathly cliffhanger which won't be resolved. ALSO READ: Did you get it? The Wild ends on M-Net with a fight about soap in the soap in an in-joke.